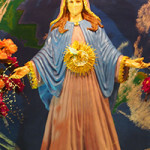 Mother Mary appeared with 2 twin Angels in a splendorous light at the ‘grotto’ at the house of Visionary Valerie, in the 3rd Joyous Mystery, in the 9th Hail Mary and the apparition took 22min. Receive a blessing that comes profoundly from My hear. I notice that many of you are losing your patience and a lot of faith. There’s no more love for one another. Why do you walk with people who are not yet spiritual, and they are never prepared to help you? They want to help you, but to go backwards. Also, don’t walk with negative thoughts, because that is in the way of your prayers and of your spiritual growth. Walk with the light and stay away from the darkness as quick as possible, because the darkness brings a lot of bad and negative influences for your family. There’s a lot of playing with each other’s feelings that hurt each other a lot. Life isn’t easy anymore, My children, life is very hard. You must work hard to reach Victory and the dreams of your lives. Always help and share with one another. Don’t say no to person whom you love most. Bring peace where there’s discord. You must have patience in life so you can gain the Celestial Glory. Always stay humble in life and keep on going with a lot of hope, despite you’re sad and crying. I your Mother and My Son Jesus give you strength to keep going forward. My children, did you start noticing how hard life is? That is why you should pray, ask and do a lot of penitence. Start a new life, believe in the Gospel, love one another and forgive one another, all of this because what is coming for the entire world. Many of you will see the signs that are coming. It’s very close to you already. Don’t forget and prepare all that My Son Jesus has requested you already in His messages. Be strong in faith and in do your deeds with love. Don’t let any bad thing make you fall into temptation. Your Mother, the Virgin of Grace of Aruba, who loves you for eternity.